Temperatures will warm to the lower to mid 70s across most of the the Rio Grande Valley on Monday, according to the National Weather Service in Brownsville. Coastal areas , however, are only expected to reach the upper 60s. Port Isabel will be 68 degrees while Ports Mansfield will see a high of 69. Expect a high of 72 in Brownsville and a high of 73 in McAllen. 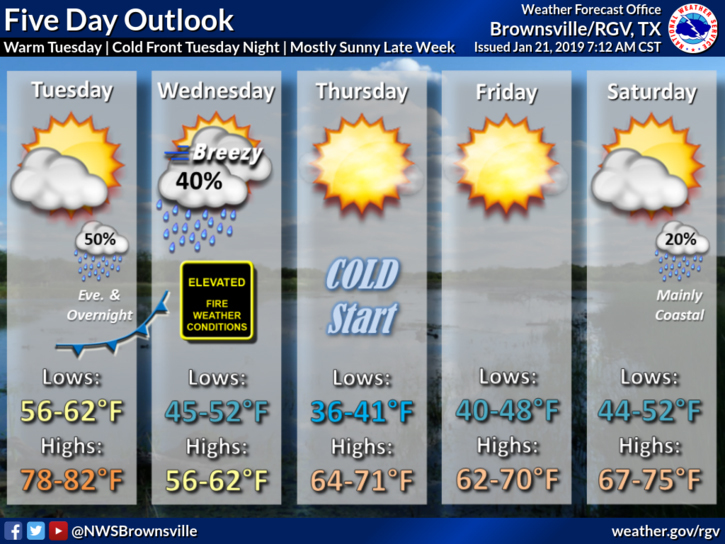 On Tuesday, high temperatures will range between 78 and 82 degrees ahead of a cold front that will lead to a chance of rain Tuesday and breezy conditions on Wednesday. That will lead to elevated fire weather conditions. For the most part, expect mostly sunny skies all week with cool mornings.